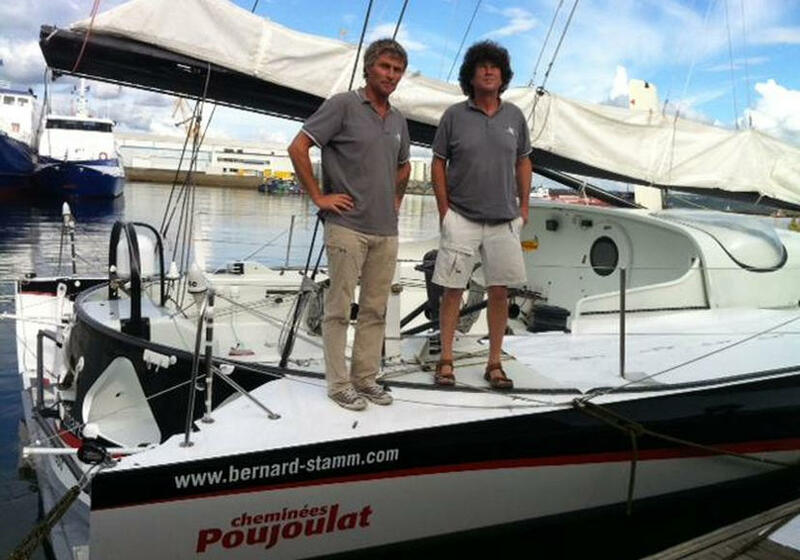 The Cheminées Poujoulat team formed by Bernard Stamm and Jean Le Cam has been through quite bustling days. Following two busy refit months in Brest, during which the rigging, the ballast configuration and the keel have been modified, the boat is finally back on the water. Last Tuesday the boat left the shipyard on a semi-trailer, the keel was fitted yesterday and the boat was launched today in the commercial port of the French city. The new Cheminées Poujoulat is the Farr design launched in 2007 on board which Michel Desjoyeaux won the Vendée Globe 2008/09 and afterwards, at the Barcelona World Race 2010/11, it finished second with Iker Martínez and Xabi Fernández as skippers. Later on it crossed the starting line of the Vendée Globe 2012/13 with Jérémie Beyou at the helm and it then temporarily became Mare. “We have made some changes, in the boom, the main sails and the headsails, among others, that will possibly result in an even faster boat than before”, explained Jean Le Cam “We have achieved what we wanted to do which is not bad at all. Not everyone can say this (giggles)”. Bernard Stamm added: “We have made the changes we considered necessary based on our experience, but we have not reinvented the boat. We have maintained what already existed and have tried to optimize it as much as possible with the time and means available”. The Swiss sailor outlined: “The launching again of the boat today is an important phase for us. Being back on the water is very good, but it is just the beginning of a new chapter: the validation of the tuning and the adjustments. Everything will take shape progressively”. Following this period, Stamm and Le Cam will begin the on water trainings. “It will be fun”, declared the French sailor. “Things look good for the Barcelona World Race, but we need to be on our guard”. It is one of the most experienced teams: “Although in separate boats, we have sailed many round the world races, this is our biggest strength”. In fact, both of them together add no less than six participations in the Vendée Globe, nine round the world races and sixty transatlantic crossings. Le Cam assured they have not yet distributed the tasks on board: “We will make the decisions together, it is a two-crew round the world race, so it is about sharing”. “What makes us different from each other? Well, that will be seen during the race,” he concluded.